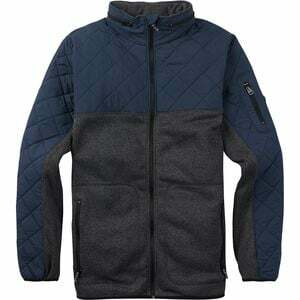 Product Condition: The Pierce Fleece Full-Zip Hoodie - Men's is in Excellent condition. This hoodie was previously owned for three weeks. The following observations were made regarding this item. *It was tried on in indoors for an occasion. *It doesn't have any defects in it at all.. *It got minor lint inside, cleanable. *All items sold as is, all warranties void. Not all fleeces are created equal, and the Burton Men's Pierce Fleece Full-Zip Hoodie is proof. Sure, its Dryride Thermex offers the cozy comfort you expect from a fleece, but that's not all it has to offer. Quilted Dryride Mist-Defy fabric repels light rain and snow to keep you dry in wet winter weather, and it's lightly insulated so you're not sacrificing any warmth. It also boasts a rollaway hood that tucks in to the collar when not needed. The result is a jacket that's prepared for autumn hikes in the mountains, but still stylish enough for date nights.